Former finance minister and detainee at Riyadh’s Ritz-Carlton in the anti-corruption clean-up attended Tuesday a cabinet meeting in the presence of the King Salman and Crown Prince Mohamed bin Salman (MbS), reports say. 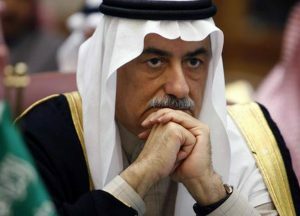 Ibrahim Assaf who also doubled as adviser to the king was pictured present at a cabinet meeting in capital Riyadh two month after being rounded up along with more than 200 individuals including scores of Princes, top officials and business tycoons. Released last month, local media say Assaf has been cleared of wrongdoing in the purge which authority claimed was directed to stamp out corruption in the monarchy. Assaf was board member of the country’s top company Aramco. He was initially accused of embezzlement related to the expansion of Mecca’s Grand Mosque and taking advantage of his position and inside information to purchase lands, Reuters reports. Critics of the purge argue that it is meant to consolidate MbS’s grip on power. Several of those detained at what is now the most luxurious prison in the world have been freed after striking monetary agreement with the authorities. One of the high profile released detainees is Prince Miteb bin Abdullah, son of King Abdullah. He was head of the kingdom’s National Guard. Prince Miteb was seen as the contender of the throne therefore a major power challenge for MbS. Miteb was set free after he reportedly agreed to pay more than $1 billion. Authorities are expecting to get from the detainees up to $100 billion, money to be used to patch up deficit and fund other development projects. Posted by KanelkaTagba on Jan 3 2018. Filed under Gulf News, Headlines. You can follow any responses to this entry through the RSS 2.0. Both comments and pings are currently closed.